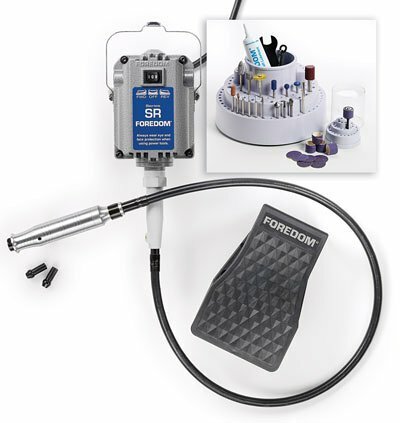 This is among Foredom’s Complete Tool Kits that was upgraded with a new, more powerful motor and more comprehensive and versatile rotary accessory selection. Tool Kits contain everything you need to get to work. They take the guesswork out of product selection, offer the best value, and feature smart tool combinations for specific applications. The 5240 Woodcarving Kit has a New Total Retail Value of $457, as a result of adding Fur, Feathers and Fins. The motor and control carry a two year warranty. All new SR Motor – Foredom’s new 1/6 hp, ball bearing, hang-up style motor with speed up to 18,000 rpm. This motor offers substantially more power than any of Foredom’s other universal motors – 66% more than Series CC and 33% more than Series S and old SR motors. The All new SR operates in forward and reverse rotation for added versatility. Buy Foredom K.5240 Woodcarving Kit at Discounted Prices ✓ FREE DELIVERY possible on eligible purchases. All new SR Motor Foredom's new 1/6 hp,ball bearing, hang-up style motor with speed up to 18,000 rpm. No. 44T Handpiece, FCT Control, No. 53 Accessory Kit, and Grease.